Background: Shilajit (mumie), a natural multi-component herbomineral ethnomedicinal food, is used as a traditional medicine for enhancing the quality of life and for management of health ailments in many countries of the world. Use of Shilajit as an adaptogen, aphrodisiac, rejuvenator and anti-aging substance is mentioned in many ancient texts. This review aims to provide comprehensive insights into its biochemical aspects, microbial role in biosynthesis, bioactivities and to establish correlation between traditional uses and scientifically validated research findings. Methods: Scientific literature and ethnopharmacological information were compiled from the published peer-reviewed articles, unpublished materials, thesis, books, patent databases, clinical trial registries and from the websites of research councils of traditional medicine. The scientific databases, thesis repositories and books databases were searched with keywords Shilajit, mumie, mumijo, salajeet, asphaltum, fulvic acid, dibenzo-alpha-pyrones etc. Results: Scientifically validated research and ancient texts suggest multifaceted benefits of Shilajit. It is endowed with anti-stress, memory and energy enhancing, antioxidant, anti-inflammatory, antidiabetic, spermatogenic, neuroprotective, antiulcer and wound healing activities. These pharmacological effects are mainly attributed to the presence of humic acid, fulvic acid, dibenzo-α-pyrones, dibenzo- α-pyrones chromoproteins and trace elements. 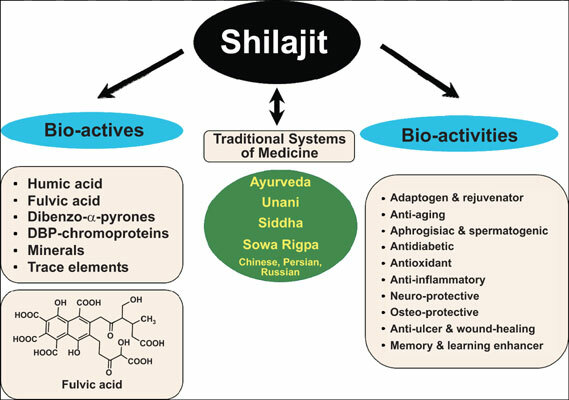 Conclusion: This review summarizes the traditional importance of Shilajit for the treatment and prevention of several acute and chronic diseases and health ailments. Despite numerous health claims, there are still major gaps in our understanding of its mechanism of action, variability in efficacy and toxicity profile. Therefore, a coordinated interdisciplinary approach is needed to establish the underlying mechanisms of action, comprehensive toxicological profile, pharmacokinetics parameters and effects on different organ systems. Regulatory and governmental impetus to basic and clinical research, safety testing and formulations quality control is warranted. Dibenzo-α-pyrones, fulvic acid, humic acid, revitalizer, Shilajit, traditional medicine.